Last spring, I was approached by Go Roma to come on down to their cool restaurant and I shared it with you here. You all know me and food, we go way back. So when anyone approaches me with free food? If this screenplay goes anywhere, they honestly don’t even need to pay me in anything other than food gift cards. I’m kidding obviously because I will need $$ to pay for my Weight Watchers membership. When they contacted me again this year to see if I would be interested in returning for more food and this time it included dessert? It was like they had heard the screenplay conversation I had with myself. Maybe I should start talking to myself more often! 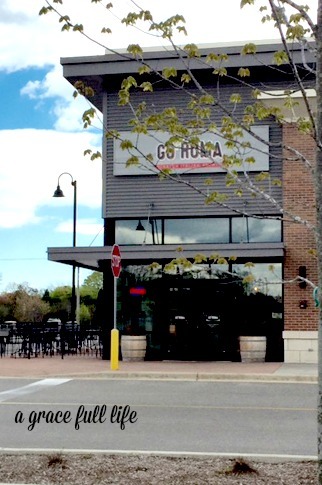 So my friend Rebecca and I went to the Glenview Go Roma to eat their anniversary pasta in honor of the one year anniversary of their opening. OR of the one year anniversary of me going to the restaurant. I chose to believe it was the latter. We met the friendly manager, Josh there; he was very nice and he even talked with us for a long time. Probably because it was my anniversary and all, hello. They gave us both lunch AND dessert! Which made us say things out loud like: this is way too much!! NOOO, we couldn’t possibly eat all of this! That is polite talk saved for people we don’t know. Then we ate all of it because please, we aren’t amateurs. But stand back if you don’t want your hand to get eaten off. 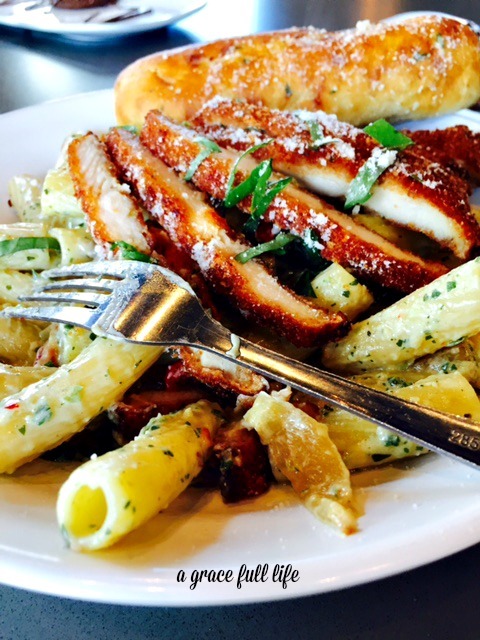 Their anniversary pasta is Parmesan Crusted Chicken made with rigatoni in this heavenly sauce. Josh said their bread is even made at a local bakery and everything else they make on site, nothing is microwaved or heated. It’s all cooked or baked right there at the restaurant. So kind of like a fancy Italian place only in fast food form. But man, that sauce is heavenly. So heavenly that I bet there are nuns back in that kitchen making the sauce daily. By the way, I took that above picture with my phone. I really need you to ooh and ahh for a moment because I am pretty damn proud of that one. 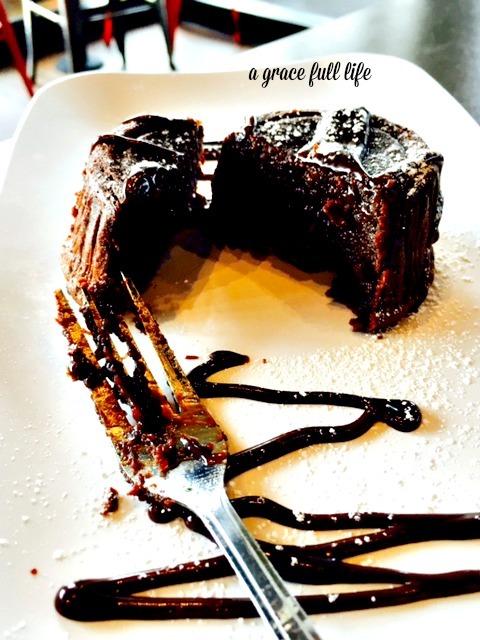 That dessert is worth the drive to a Go Roma restaurant. I mean, so is that pasta but DESSERT. This is what my husband would call “happy plate”. We made “happy plate” at Go Roma this day. Then snuck out as not to be embarrassed at the mass quantities of food we ate. We might have even gotten ice cream on the way home. Told you, no amateur hour here. Go Roma is always looking out for us and they have your back yet again. 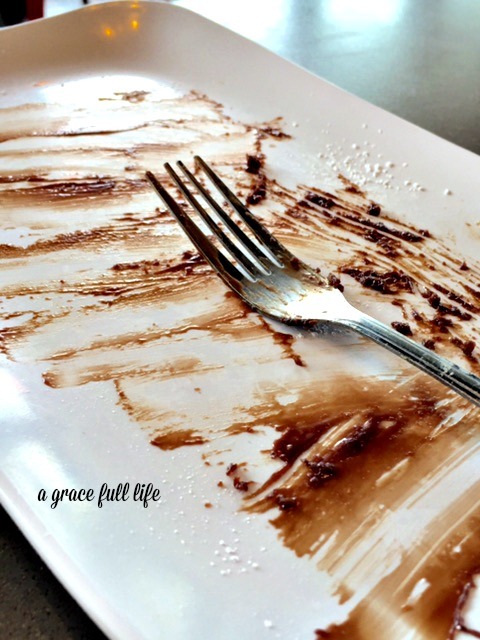 You have a chance to get yourself some of that dessert! They are giving one lucky winner a $25 gift card! The giveaway ends May 17th so enter today. Now through mid-June, you can head to Go Roma and party like it’s your Anniversary! 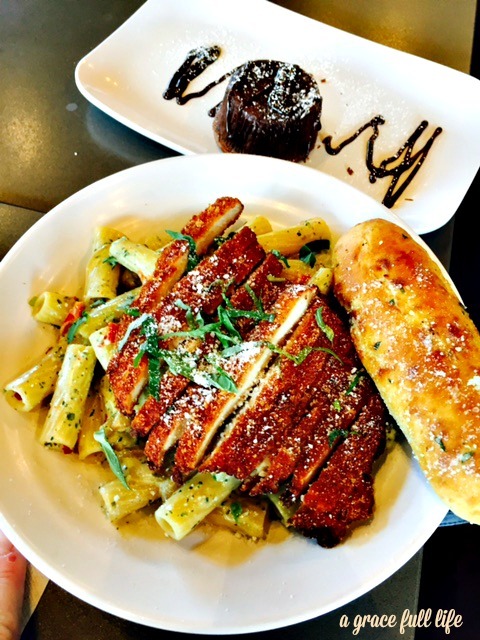 Their anniversary pasta is only $9.49 at the Glenview, Bolingbrook, and Northbrook locations. Head on in and tell them the anniversary girl sent you. The one who can eat the pasta and dessert in one sitting.